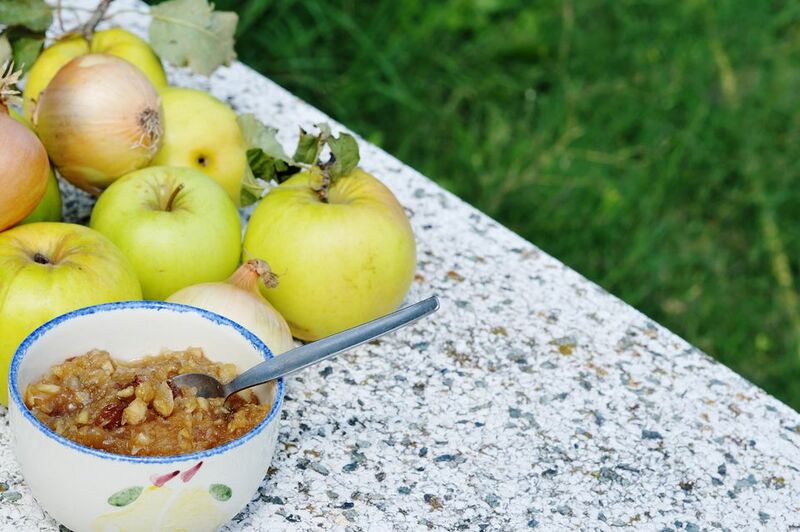 Haralsen, Granny Smith, or Rome apples are a good choice for this chutney. I like washing the jars and lids in the dishwasher and taking them out right before filling them with the chutney. That's the best way to ensure you have hot, clean jars to fill. Combine all ingredients in a heavy medium saucepan and stir to combine. Bring mixture to a hard boil over medium high heat, stirring frequently. Reduce heat to medium and boil for 4-5 minutes until apples are soft, begin to break apart, and mixture is thickened, stirring often. Cool chutney for 5 minutes, then pour into 2 clean, hot 8-oz. jars. Cover tightly with screw lids. Store in the refrigerator up to 3 weeks, or in the freezer up to 3 months. This chutney must be stored in the refrigerator or freezer; it is not shelf stable.